Reader Adam Vorphilack writes to share a photo of an awesome water sphere sculpture done in chromed steel. This is an award that the Moog site in New York awards to retirees. 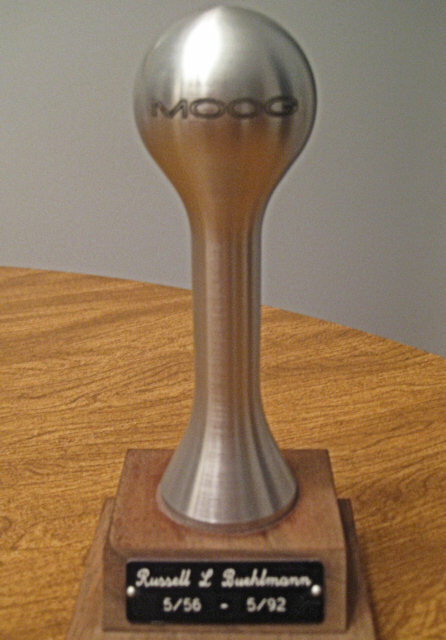 You got to give credit to the Moog company. They love their water sphere, and being a true water sphere, it’s a work of art that should be preserved. Is this sculpture a bit creepy? Yes! Its squat neck yells out to be grabbed. The neck is so thick that this water sphere has no shoulders. This work looks more like a weapon or a handle than a water sphere. The World’s Tallest Water Sphere clearly has more beautiful proportions. The WTWS balances its globe precariously up in the heavens. The WTWS is the true work of art. This entry was posted on Saturday, May 7th, 2011 at 9:38 am	and is filed under Art, Competitors, Photos. You can follow any responses to this entry through the RSS 2.0 feed. Both comments and pings are currently closed.